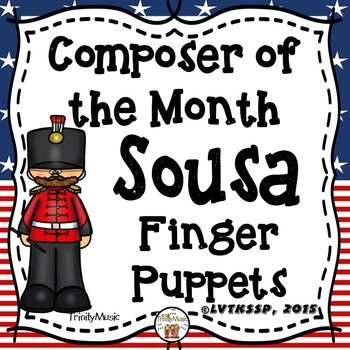 Bring the music of John Philip Sousa (Composer of the Month) to life for your students with these cute finger puppets as they learn about the composer and his music. These are perfect to use as part of a workstation. 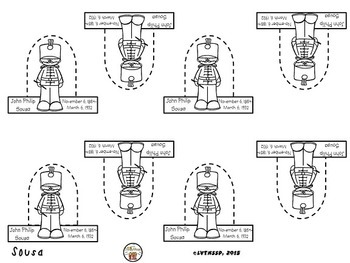 have your students make a finger puppet and then use it to conduct the beat or to learn about 2/4 time signature. These can also be used to practice vocalizations or students can use the puppet to show variations in the music such as high/low, fast/slow, loud/soft, timbre, form, instrumentation, etc. Images are in color and black & white and there are eight puppets to a page. No need for card stock - regular paper works fine. Cut out and tape around the finger. You can have your students color the black and white images or simply print the "color" versions. The color images even look great printed in black and white on a basic copier. Two versions (with cutting guidelines and without) are included for you. The Common Core Standards were developed and written by the NGA. 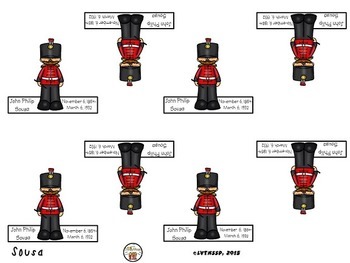 © Copyright 2010. National Governors Association Center for Best Practices and Council of Chief State School Officers. All rights reserved.